MIYABI strives for perfection with Kaizen - Japanese for "improvement" or "change for the better." 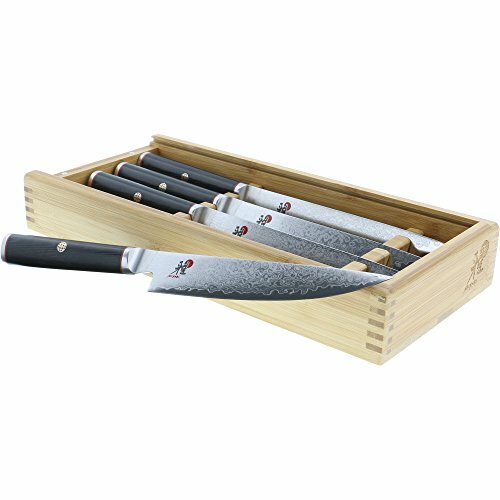 This line of knives combines the best hardening technology with the artistry of traditional Japanese craftsmanship. The resilient core of VG10 super steel is protected by a stunning 64-layer flower Damascus pattern.The CRYODUR blades feature exceptional sharpness and durability thanks to their innovative, icehardening treatment. Then, artisans hand-hone the blades with the historic Honbazuke method. This attention to detail translates into precision cutting for MIYABI Kaizen users.The blade is balanced by a refined D-shaped handle made of black linen Micarta. With a wood-like texture, the comfortable handle won't slip from your hand and acts as a moisture repellant. Handcrafted in Seki, Japan.